Are you cool with Lakers president Magic Johnson's critical comments of Kyrie Irving? Missed this interview when it first took place a couple weeks ago, but watching it last night I was surprised to see how candid Lakers president Magic Johnson was about another team's star player. 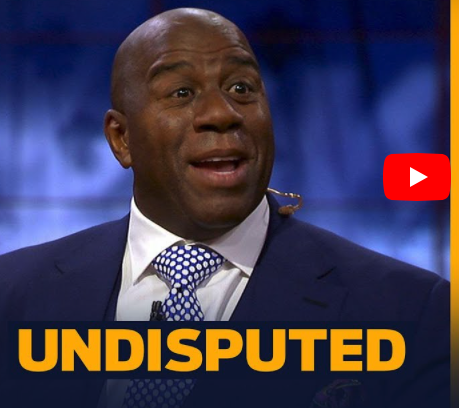 Magic has always been a great ambassador for the game, but once he took over the reins to run the Lakers, his freedom to just say what he wants changed. He got the Lakers in hot water and brought upon them tampering charges with his comments regarding Paul George. In this case, he's obviously not trying to tamper to woo Kyrie to Los Angeles or anything. Magic's just basically bashing Irving as a selfish player who cared more about his brand than winning championships. Analysts and blowhards like Shannon Sharpe and Skip Bayless are free to say whatever they like. Didn't think that NBA GM's could do the same. Can't remember GM Danny Ainge ever talking negatively about another team's player when it had nothing to do with the Celtics. I suppose Phil Jackson did something similar when he talked negatively about LeBron James and his "posse" last year and again it's not tampering, because you're not exactly wooing a free agent by being critical. Just doesn't seem like the proper protocol. Don't be surprised if Magic gets himself in trouble again as we get closer to free agency this summer and Adam Silver will need to remind him he's no longer an analyst, but a front office employee. p.s. Bayless and Sharpe might actually be more annoying than Bayless and Stephen A. Related: Video: Are the NBA's tampering fines a joke?